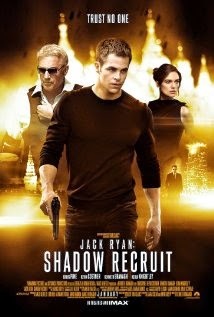 Plot: A young Jack Ryan is recruited by the CIA to be a Wall Street analyst to find terrorists' hidden money trails. This film is action-packed, intense and has a great story-line. Fans of the earlier Jack Ryan movies will be very happy with this reboot as will fans of the Tom Clancy novels. Chris Pine does a wonderful job playing a learning-on-the-job CIA agent. Kevin Costner does nice work as Ryan's handler. He helps along the plot with pertinent information without getting in the way of the the lead. If you are looking for a smart action flick this week, I highly recommend checking out JACK RYAN: SHADOW RECRUIT. 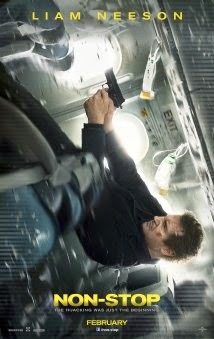 Plot: A Federal Air Marshal must save a plane from a terrorist attack, but all the powers that be think he is the one that has hijacked the plane. While NON-STOP is formulaic in every way with the typical rabbit chases and straw men it is still a highly suspenseful and fun movie. There were several times where I found myself literally sitting on the edge of my seat, and a few times where I gasped for breath after realizing I had been holding my breath for several seconds. If you like suspenseful action flicks with a good dose of mystery, NON-STOP will satisfy. It was a fun and enjoyable action flick. Nothing more, nothing less. I think a sequel would be pretty cool.